Nothing beats a hearty casserole on a wet and thundery day… and boy have we been having a spat of those! My friend Lisa is an excellent cook. We were elated when she invited us both over for one of her famous beef beer dinners. 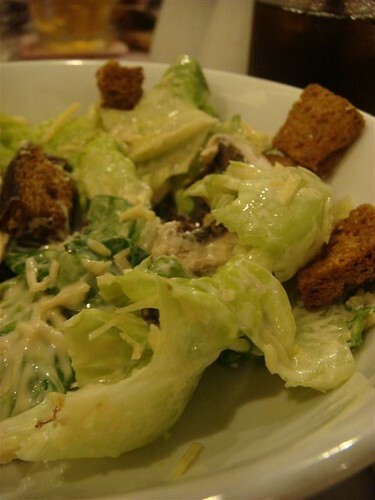 First, the homemade Caesar salad. Even the sauce is made from scratch! Light, crunchy yet healthy – the prefect prelude to a meaty dinner. Then the garlic bread. Toasted till it is crispy at the edges and oozing with butter and garlic and herbs. I love homemade garlic butter because it has THAT much more garlic and butter, know what I mean? 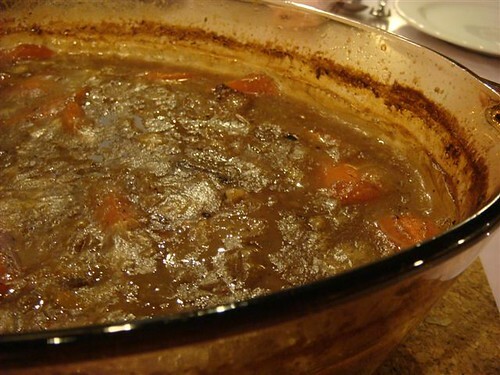 This is the amazing Beef Beer… a whole, massive pot of it ! I love the way Lisa cooks this … over a slow fire, with lots of tender loving care… beef simmering all day long in beer, so much so that the heady aroma is the first thing you smell wafting out of her kitchen when you walk through the front door! Not only that, she uses Beef Brisket to ensure it melts in your mouth. Rapture! 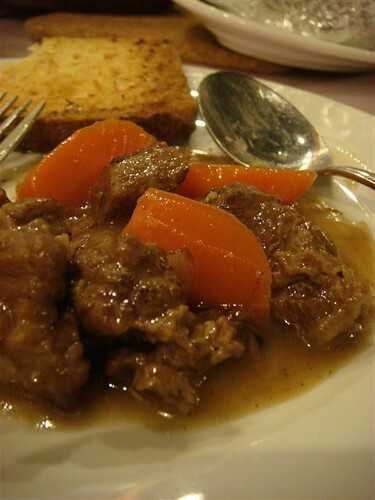 So, if Beef Beer Stew and Mash is my comfort food on a wet & stormy night, what is yours? Feel free to leave a comment. Cheers! Droooooooool 🙂 Perfect on a stormy rainy nite aka last nite. I had Sure Pizza pasta at Damas!! as tasty as your cooking i am sure! hmmmm sunday roast..hahah i used to dread the days..either beef, pork or lamb..
now the craving comes back..its strange isnt when u want the things u used to hate? hence the name… Joe, who’s constantly craving! 😉 cute! My comfort food is lasagna followed by vanilla ice-cream! how do we secure an invite to this lisa chick’s place? i love beef brisket. LISA , IF YOU ARE READING THIS CAN MY BLOGGER FRIENDS COME PLEASE?! 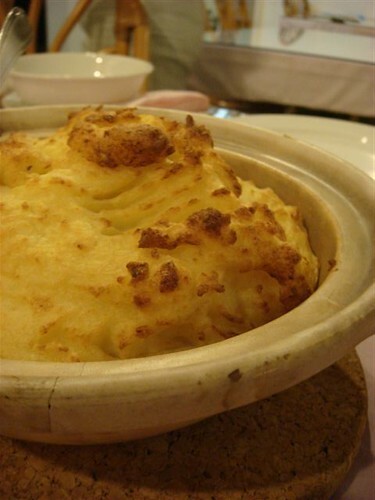 How gorgeous is that mash! And beer with anything always works! My ultimate comfort food is Japanese curry! With rice! absolutely! beef cooked in beer! wow. your friend can really cook! stew beef with beer. and mashed potatoes. and garlic bread. ah..! asian spicy food types for you eh? Wooowww woooowww weeeee!!! I am very interested to be friend with Lisa too. Intro can ar? I am drooling at the beef beer. Wonder if she is willing to share the recipe! haha.. what can i say? I’ll ask Lisa! how true! it has just started raining outside … makes me feel like having some beef all over again! lol, she’ll be happy to know! What kind of comfort meal on cool night can beat that? hic hic hic, burp burp burp! My ultimate comfort food- loads! But here's a few- anything grease with beer (wedges, onion rings). N when I'm really hungry, gimme rice, hot soup and sweet & sour pork! Is it weird that I could literally smell the garlic and butter and herbs when I scrolled down to the pic of your friend’s garlic bread? i hear what you are saying! I love oily carbs with my beer too.. or pork crackling! nothing beats a chunky piece of tender beef and the aromatic taste of beer, eh? EXCELLENT!!! comfort food? maggi mee asam laksa flavour! 🙂 or nong shim’s kim chi noodle. and cable tv! ok lar, cannot get reception if the rain’s too heavy…hehehehehee……. assam laksa! you a maggie mee junkie too eh?! nice! Yes, the rain: Humid afternoons, traffic jams and wet laundry. Casserole beef…. Perfecto esp. 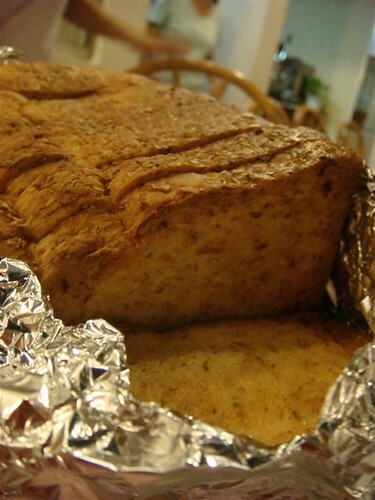 if the bread is homemade! Homer Simpson would love your Sunday roast… haha. Must admit I’ve never tried roast beef with beer but it sounds like it’d be a good idea. Thx for linking to us btw! O lisa lisa , V shall drink thee 2 .
man, i wan friends like yours!!! hehe. funnily enough, my comfort food is instant noodles with egg & luncheon meat. 😛 must be those uni days. uni days are the best! mine’s either steamboat or Bak Kut Teh! and how are caesar salads ever healthy? got egg yolk wor, the powerhouse of cholesterol…. hello! yes, homemade is the best because they put heaps of stuff in it! best cook food is home cook food! fasntastic taste I presumely!